So this newborn image ties into the maternity session that we had with mom, Christina, who was having twin girls. 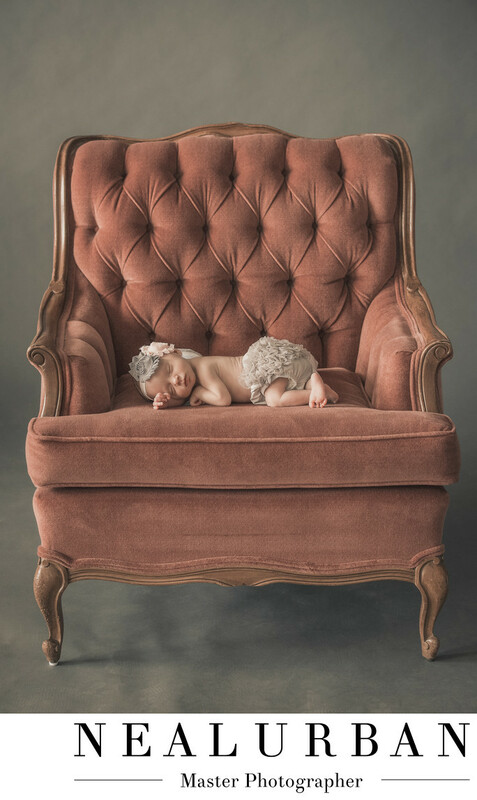 To stay with the vintage maternity theme, we used this antique chair. This chair is not from an antique store. This chair belonged to our family and when they moved we took the chair off of their hands. This cutie was one of the twins. We had to do some solo newborn photos of each. The color of the head band and diaper cover paired perfect with the color of the chair. Christina's maternity shoot featured a belt that looked just like the head band you see on the baby here. So many little details to take in account for shoots. And these little details make the shoots more memorable. Newborn sessions are not the easiest to photograph either. They can take a few hours and the studio needs to be very warm to help the baby sleep. You go into the shoot with one or two specific ideas in mind. Before the session, we always collaborate with the parents to go over ideas and outfits too. We all need to be on the same page. The parents usually hang out in our lounge area while we work. They are pretty exhausted. For best results, newborn shoots, need to be done within 9 days of the birth. The baby is not very mobile and we hope they sleep a lot! Once the baby is in a deep sleep, we are able to do multiple sets or changes. Overall, keep the baby happy! That is key to create gorgeous and timeless photos! Location: 2495 Main Street, Buffalo, NY 14214.